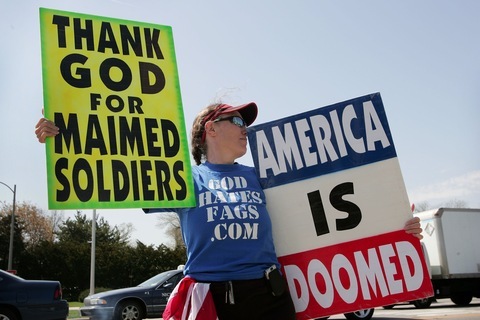 A member of Westboro Baptist Church protests at a veterans’ hospital in Virginia. File photo by Scott Olson/Getty Images. On the steps of the Supreme Court this morning, members of the Westboro Baptist Church will be carrying signs, singing songs and protesting, well, their right to protest. The high court will hear arguments in the case of Snyder v. Phelps, which centers on the Kansas-based fundamentalist church’s practice of protesting at the funerals of service members who have died in Iraq and Afghanistan. Westboro Baptist is almost entirely made up of family members of its founder, Rev. Fred Phelps. The group argues that American troops die in Iraq and Afghanistan as a punishment from God for the country’s acceptance of homosexuality. Snyder contends that the group’s presence at his only son’s funeral and a subsequent post condemning him and Matthew on the group’s website intentionally inflicted emotional distress. The Phelps family, who will be represented by Phelps’ daughter, Margie (all of his 13 children went to law school), argues that their actions, even if extreme, are protected under the First Amendment. Snyder was awarded nearly $11 million by a jury in civil court. A judge later knocked that down to $5 million, but the Federal Appeals Court in Richmond, Va., threw out the verdict, stating the Phelps family acted within their rights. Gov. Charlie Crist, former Florida House Speaker Marco Rubio and Rep. Kendrick Meek are set to face off in their second televised debate in this fascinating three-way race for the U.S. Senate seat in Florida. Much like Linda McMahon tried to do in Connecticut earlier this week, Crist released a hard-hitting ad against Rubio, his most significant opponent, to help steer the conversation at the debate and perhaps rattle the opposition. “On the eve of a pivotal debate in the U.S. Senate race, Gov. Charlie Crist on Tuesday pulled out a tried-and-true political weapon against frontrunner Marco Rubio: sounding the alarm on Social Security,” writes Beth Reinhard of the Miami Herald. Gov. Crist has made Social Security a central issue in the campaign and is hoping to woo Florida’s substantial senior citizen population by pointing to Rubio’s suggestion that the retirement age be raised. Crist neglects to add that Rubio specifically suggests that for younger workers, not current recipients of benefits nor those near retirement age. Rubio’s campaign has called foul on Crist’s ad, but you can be certain it will be front and center at Wednesday’s debate at 7 p.m. EDT. A new poll released Tuesday found that Latino voters, a key Democratic voting group, are less motivated to go to the polls this November. The Pew Hispanic Center survey shows just 32 percent of Hispanic registered voters have given the midterm elections “quite a lot” of thought. Just two years ago, 67 percent of Hispanic voters nationwide cast their ballot for President Obama, more than doubling the support for John McCain. Plus, the number of Latinos who voted in 2008 increased by 25 percent over four years earlier. In some states where Latinos make up a significant percentage of the population, depressed turnout could swing certain races in favor of the Republican candidate. Still, there’s a silver lining for Democrats in the poll. Latino support for the party remains strong, with 65 percent saying they plan to support their Democratic congressional candidate, versus 22 percent who intend to back the Republican. The survey also reveals that immigration reform is not a top concern for Hispanic voters, despite the enactment of a controversial law in Arizona earlier this year and calls by some to repeal birthright citizenship. Respondents named education, jobs and health care as their top three concerns in the elections, while immigration ranked fifth. Democrats are eager to make 2010 a choice election, as opposed to a referendum on President Obama and the state of the economy. Gov. Jack Markell of Delaware, chairman of Democratic Governors Association, made the case Tuesday that despite the national environment favoring Republicans, voters in individual states would see the Republican candidates in states like Florida, Ohio, Colorado and Minnesota as poor choices compared to the Democratic alternative. Unlike the environment in races for U.S. House and Senate seats, the gubernatorial races allow Democrats to play a bit more offense. In large states like Florida, California and Texas, Democrats have chance at picking up seats. Gov. Markell also noted that winning these governor’s seats can help Democrats influence the redistricting process in those growing states. Since Vietnam, debates over defense spending tended to be between right and left. Now, on both sides of the Atlantic, conservative politicians are engaging in their own serious arguments over whether defense money should be on the table when the budget cutters enter with their axes and scalpels. In the United Kingdom, where the new Conservative-Liberal coalition government has pledged major league austerity to drive down the country’s record peace-time deficits, a row has ensued between the defense minister and chancellor of the exchequer (treasury minister) over planned defense cuts. A leaked memo from Minister of Defense Liam Fox has put the debate on the front pages. Two sets of debates are involved in paring the $62 billion defense budget. Should be cuts come in big ticket items such as nuclear submarines, aircraft carriers and advanced aircraft or trimming ground forces? And how far can any cuts go before Britain is reduced from being a European power, ready to join the U.S. and lead NATO in future operations, to the military equivalent of Italy or Spain? Now, as reported by Josh Rogin in The Cable, a similar debate is echoing among American conservatives, although the U.S. defense budget at more than $660 billion dwarfs those of all other nations combined and few are arguing that cuts would shrink the U.S. military to second-class status. But earlier this week, three conservative groups — American Enterprise Institute, Heritage Foundation and the Foreign Policy Initiative issued a joint op-ed in The Wall Street Journal saying defense spending should be off the table for budget cutters. Rogin said they were taking aim at fellow conservatives, Kentucky Senate candidate Rand Paul, Oklahoma Senator Tom Coburn and Indiana governor and former U.S. budget chief Mitch Daniels. When a new class of Republicans who ran on wasteful government spending arrive in Washington, this debate within the GOP is all but certain to continue.